Many gardeners are intimidated when it comes to training and pruning container garden plants. There comes a time when some grooming is needed to maintain an attractive container. Grooming can consist of pinching, deadheading and general cleanup. Pinching refers to removing the growing tip of a plant. When plants get too tall and start to get leggy, removing the top of the plant results in lowering the height as well as causing the plant to develop a bushier habit. Pinching also helps to maintain a certain shape and keep growth in check on some of the more vigorous plants. Cutting back vining plants would also fit into the category of pinching. To pinch, simply remove a small amount of the tip of a branch with either your fingers or pruning shears. Once pinched, new shots soon develop to fill in the plant. While pinching is not a daily task, look at the plant on occasion to decide if pinching will improve the shape and appearance. 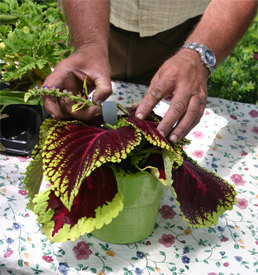 Deadheading applies to flowering plants. After plants get done flowering, all that is left are spent flower heads. These spent heads are great places for disease to develop (botrytis) as well as cause the plant to bloom less. After the flower has started to decline and is no longer attractive, simply cut the flower stalk out. This cleans the plant up, reduces disease problems and encourages rebloom. Some plants don't require deadheading and are often termed "self-cleaning." Petunias, begonias and vinca fall into this category. General clean up entails the occasional leaf removal due to insects, disease or just natural decline. Keeping a container garden tidy is not difficult as it can be easily done when you walk by, or you can combine it with another task such as watering.